Machine, ceramic and organic colors, decoration technology for flat glass like sandblasting, screen printing, rollercoating, spraying etc. Professional organic paints system for flat glass. Make your own back painted glass! GDS Technology has taken appropriate action in line with the GDPR. 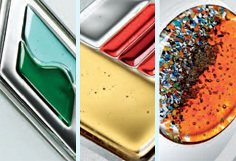 Let us invite you to Glass Fair Vitrum in Milano. Let us invite you to the GLASS DAYS presentation as a part of traditional event ZLIN DESIGN WEEK 2017. And GDS Technology is part of Glass Association presentation! 11th and 12th of November was in Glass School in Valasske Mezirici second annual Glass Sympozium. GDS Technology as traditional school partner was there. GDS team would like to wish you a very happy Easter. We are traditional producer of Ceramic Enamel Paints for toughened glass. More than 20 years experience with tinting process. Only room temperature drying technology! Make your own painted glass. Easily, quickly, effectively, thousands of colors (RAL, NCS, Pantone). Registration l Forgot password ? ... and all products and technologies for glass decoration. Ceramic enamels, organic paints. Rollercoaters or spraying machines. Sandblasting systems (cabinets, masks, accessories).